One area I have been really interested in lately is gesture drawing. I have found it to be a fantastic way to improve how I see as an artist and train my understanding of form and anatomy. Over the past few months I have spent about 10 to 20 minutes a day doing some simple gesture drawings in the morning. As a result, I have seen significant benefits to my overall development as an artist. I am still primarily interested in painting, but sometimes in order to continue improving in one area, you need to explore other areas. 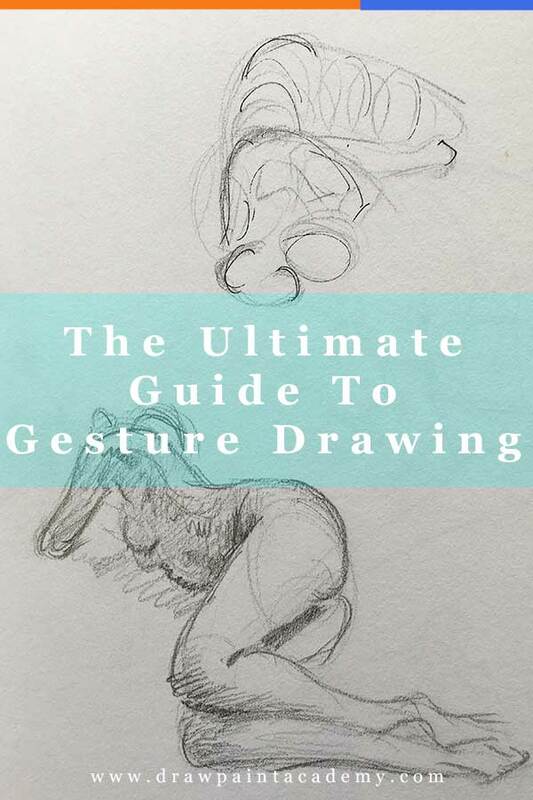 So in light of this, I put together a complete guide to gesture drawing for those of you who also want to practice it. 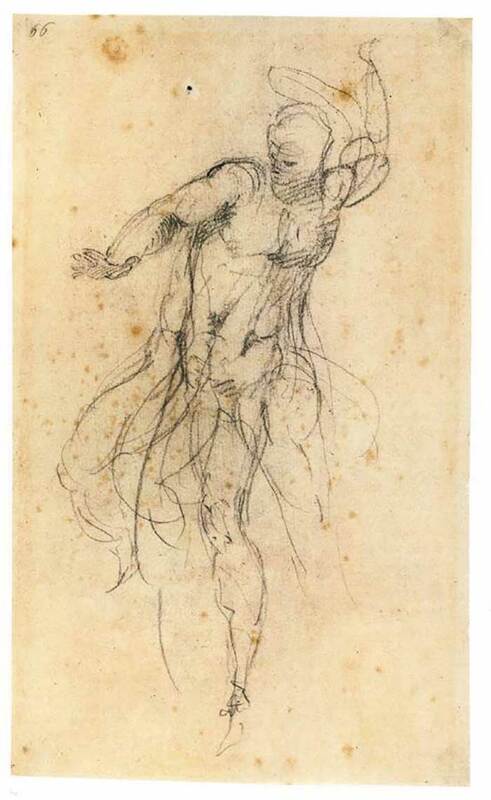 Gesture drawing involves capturing the action, form and pose of a subject. 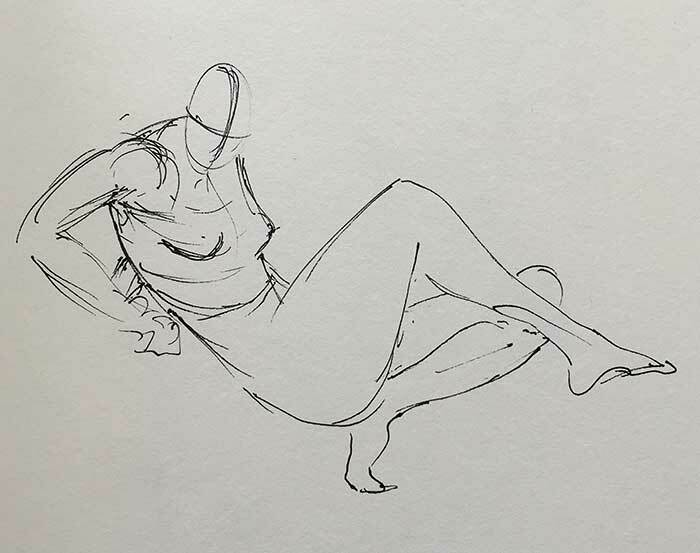 Typically, you will draw a model who adopts timed poses ranging from 1 to 5 minutes. The shorter the pose, the less information you will be able to capture. 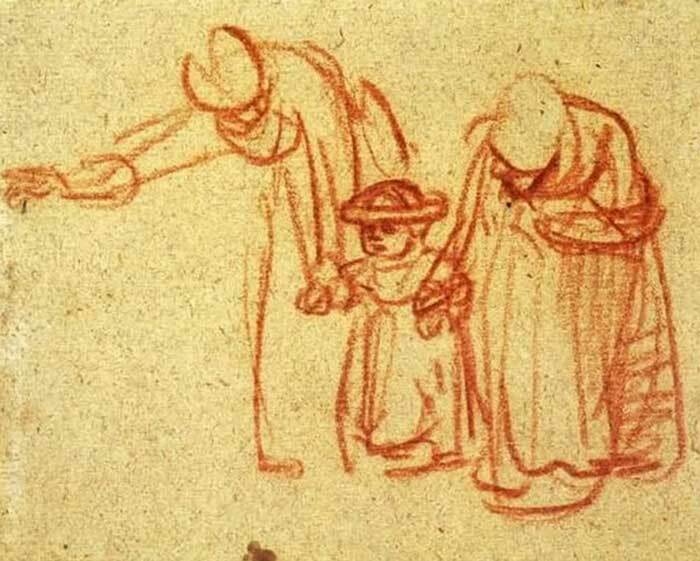 In the most primitive form, a gesture drawing could be nothing more than a couple of curved lines which indicate the gesture. For longer poses, you can start adding more detail and tone. How is the arm connected to the rest of the body? Are there any twists or pinches in the muscles? Is the arm facing toward or away from me? What is the contour of the arm? Do you see the difference between these questions and merely copying what you see? Copying what you see is fine, but to really see like an artist, then you need to understand what is going on and what you are actually seeing. It does not take up much time. The set-up time for gesture drawing is minimal. All you need is a pen/pencil and a sketchbook. And the poses can be as short as 1 minute. So you can easily fit in gesture drawing in short intervals throughout the day. As noted earlier, I have been practicing gesture drawing every morning for the past few months. I actually find it to be a very relaxing start to the day. You do not have to worry about making mistakes. You should not be doing any erasing in gesture drawing. If you make a mistake, then just learn from it and move on to the next drawing. You will see noticeable improvements in your drawing within a relatively short period of time. This is because you are working relatively fast and will encounter so many more problems than if you were just doing one large artwork. The more problems you encounter, the more solutions you will develop. You will learn how to draw more instinctively. You cannot afford to think too much with gesture drawing, so you need to rely much more on instinct. You will gain a better understanding of form and the human anatomy. This is one of the main reasons people practice gesture drawing in the first place. It really gives you a feel for the form and anatomy of the human body. You will learn how the body moves and is connected. It will indirectly benefit your painting skills. Drawing is the backbone of painting, so do not overlook it. Gesture drawing is a very efficient way to hone your drawing skills without having to commit a significant amount of time to it. It is great for warming up your hands. I often find my first drawings in a session are rigid and tight. My hands just do not do what my eyes want them to do. But as I progress, my hands and eyes warm up and everything starts to flow. Start with the head first. Everything flows from the head and it helps to develop a consistent starting point. With each pose, I will look for the head and quickly draw the outline before moving on to the rest of the pose. By doing this, there is no hesitation at the start of every pose as I know exactly how I want to start. Also, try to make a quick note of where the head is looking (up, down, left, right). After you have identified the head, then observe how the rest of the body is flowing from there. A great reference point is the spine. If I am ever lost, I just follow the spine and try to build form around that. Always be thinking about the contour of the body. Is the body leaning toward or away? Where are the pinches and changes in direction? You can then use simple contour lines to give an indication of this. Not every line needs to follow the contour, but it is useful to have a few major contour lines as reference points. Try to capture the essence of the pose before you try to render form. Regardless of any time limits, the first thing you should do in gesture drawing is capture the essence of the pose. Once you have done that, you can go over and render with more detail and tone. This follows the general art guideline of working general to specific. Use simple and meaningful lines. Try to draw every line with some kind of purpose. Do not draw lines just for the sake of drawing lines. I usually make a few practice strokes in the air before committing to the paper. Kind of like how a golfer will make a few practice swings before connecting with the ball. Working quickly does not mean working recklessly. Working quickly is more about making quick decisions rather than making quick strokes of your pencil/pen. If you watch some of the really great drawers like Glenn Vilppu and Steve Huston, you should notice how slow they work, even when working with timed poses (there are videos of these two artists later in this post). Don’t just copy. Try to really get a feel for the pose and action. This is the purpose of gesture drawing. Embrace the curves. You should be careful with straight lines. Most of the time, curved lines are much more effective for rendering the human form. So instead of drawing a straight line for an arm, think about the action and pose of that arm and use curves to render this. Try to capture what you like most about the pose. Usually, there will only be one or two things which you really like about a certain pose. Focus on those aspects and really try to emphasize them. It could be the pinch in the shoulder, the curve of the back or form of the chest. Sometimes you may even want to exaggerate the pose slightly to really capture what you want out of the pose. What Medium Should You Use For Gesture Drawing? Gesture drawing is fantastic for experimenting with different mediums which you are not familiar with. The only requirement I would suggest is that you pick a fast-drying medium (so you may want to avoid oils for gesture drawing). You will find the way you draw will change depending on the medium you use. For pen and ink I rely heavily on line rather than tone or shape. But with pencils or markers, I can incorporate more tonal work. Pen and ink: fantastic for line work but not so much for tonal work. Pencil: similar to pen and ink but you can use the broad side of the pencil for shading. You also have a much wider range of tones you can use which varies based on the pressure you apply. You can read more about the different drawing pencils here. Markers: great for bold strokes. Steve Huston suggests that you use old markers which have dried slightly. Some kind of fast-drying wet medium (like watercolor brush pens): useful for quick and broad washes of color. You can get some interesting results by combining a wet medium with something like pen and ink. 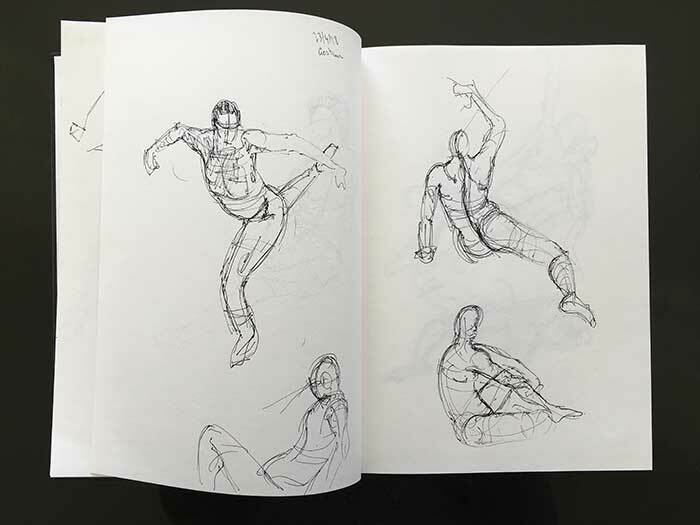 In this video you can see Glenn Vilppu doing gesture drawing with several different mediums. Below are two gesture drawings created using mostly pencil. In the bottom sketch, I had more time so I could start incorporating more tonal work. The pencil excels at this as you have a much wider range of tones which you can use compared to some other mediums like pen and ink. The top drawing is much more primitive as I only had a minute to capture the pose. I also went over the top of the drawing with some pen and ink to really emphasize some of the contours and edges. Remember, there are no rules to gesture drawing so you can mix and match the mediums you use to suit how you want to draw. Should You Draw From Life? It is generally recommended that you draw from life if possible. It is harder than drawing from a static reference, but it is the best way to really get a feel for the pose and form of a model. But you do not need to draw from life. The next best thing is to take advantage of all the amazing resources on the internet. There are many free reference libraries which you can draw from. I discuss some of these later in this post. But if you can attend live drawing sessions, then by all means try to attend those. How To Draw Gesture by Proko. Stan Prokopenko walks you through the basics of gesture drawing in this video. He is a classically trained artist and has a very popular Youtube channel related to drawing. The 7 Ls Of Gesture Drawing by Alphonso Dunn. Alphonso Dunn focuses on pen and ink and has a beautifully relaxed style with his gesture drawing. In this video he provides some general tips for gesture drawing. Timed model drawing with Glenn Vilppu. Glenn Vilppu is a master artist and teacher. In this video you get to look over his shoulder as he does timed gesture drawing. Timed model drawing with Steve Huston. Steve Huston is another master artist and teacher. If you are not familiar with his paintings, I strongly recommend you check them out. What I find interesting is the difference in style between Steve Huston and Glenn Vilppu. They both have a remarkable confidence, yet work in completely different ways. 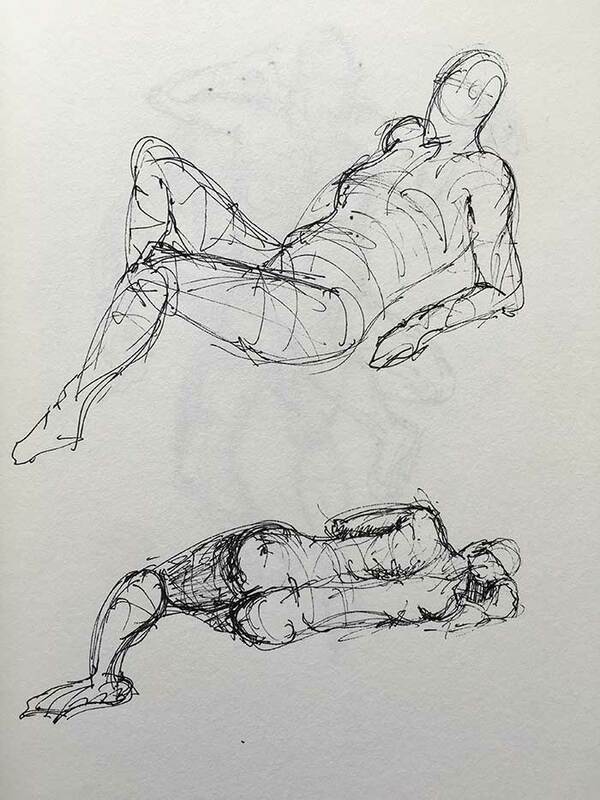 Daily Life Drawing by New Masters Academy. New Masters Academy has a number of these free pose videos which are very high-quality. Draw This. This Youtube channel is purely dedicated to providing live videos of pose sessions. There seems to be a new pose video added each week. 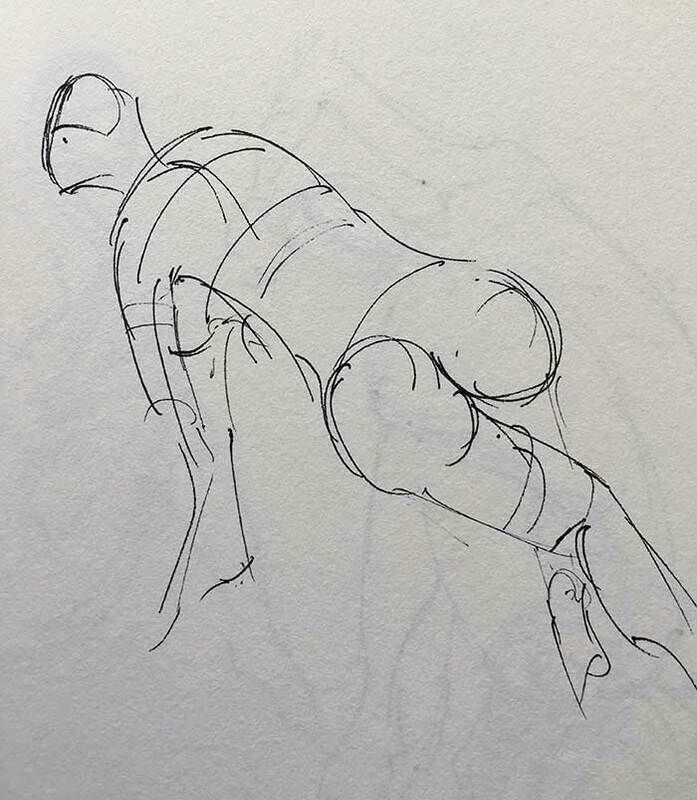 Line Of Action - This is one of the leading websites for gesture drawing. There is a dedicated forum for drawing and a pose library for gesture drawing practice. Sketch Daily - A pose library with almost 2,000 images. 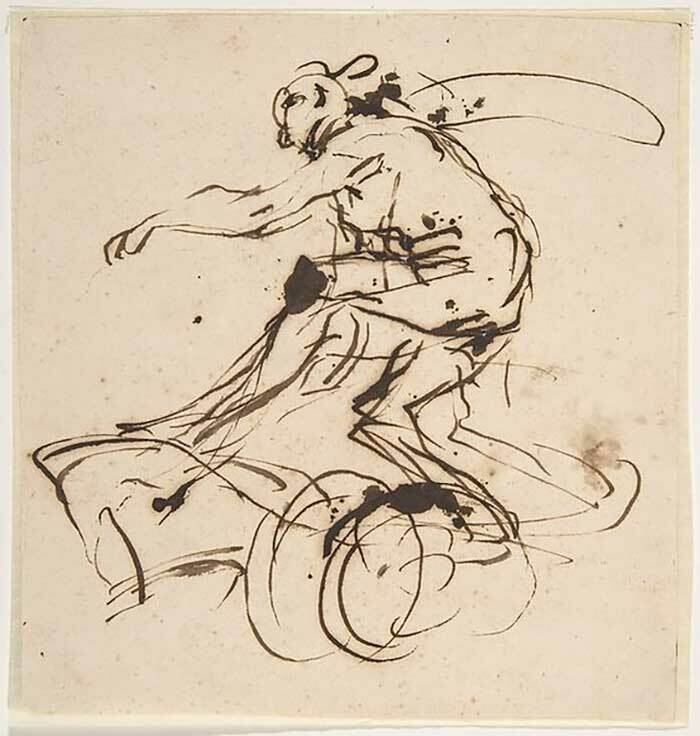 Here are some gesture drawings by famous artists of history. The great thing about gesture drawing is that anyone can do it and all you need is a pen/pencil and paper. I have only started gesture drawing more seriously in the recent months, but I already feel like I have improved my understanding of form, my hand dexterity and my overall artistic ability. If you have not tried gesture drawing before, then I strongly suggest you give it a try. It can be extremely relaxing and rewarding once you start to really get a feel for it. Affiliate disclosure: There may be affiliate links to recommended products in this post (such as Amazon). If you purchase through any affiliate links I will receive a small commission at no additional cost to you. These funds are used to help grow this website and spread art education to people around the world. Thanks! Thanks much for the detailed information. Thanks, Dan! Very good article; gesture drawing practice is great for when figures are needed in a painting, whether small or large. They can add interest in some paintings.